During the past few months, many of the distinctive architectural features of Theatre for a New Audience’s first home have become apparent. Gleaming charcoal-covered panels have been installed on the north and west façades, which change dramatically in different weather and light conditions. 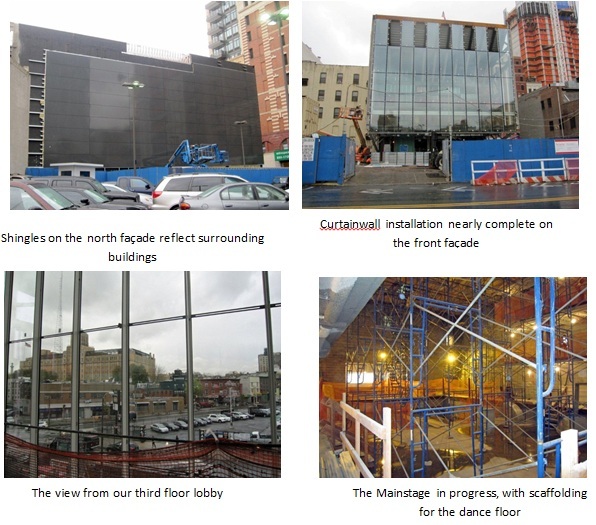 The east façade’s signature glass curtainwall, providing a 60 x 60-foot expanse of transparency into the theatre’s lobby, is now being installed. The 12 x 5-foot glass panes are triple-glazed, which will guard against heat gain and energy loss. Each pane weighs 1,200 pounds, requiring a crane to put it into place. The total weight of the curtainwall is more than 30 tons. On the ground-floor level, 12-foot tall panes will be joined by silicone, creating the illusion of a continuous sheet of glass that connects the lobby fluidly to the Arts Plaza that surrounds the front of the building. All glass should be in place by early December, and the building will be fully enclosed for the winter. Inside the Samuel H. Scripps Mainstage, construction of the performance space continues. A 35-foot high “dance floor” of scaffolding is now in place, allowing for mechanical and electrical installation in the Mainstage ceiling. Acoustic features of the Mainstage include wooden wall panels of varying widths, alternating with fabric-wrapped panels. This combination of reflection and absorption will create an ideal environment for live, unamplified performance.